The most recent patches to Fedora’s Qemu 0.14 went into qemu-0.14.0-6.fc14.src.rpm on 03/31/2011. 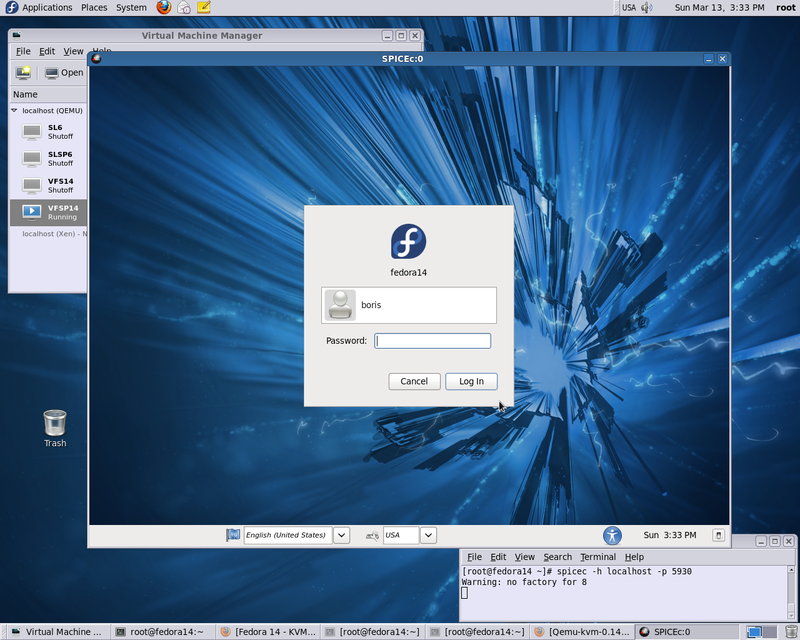 Following bellow is brief description of F14 KVM and Spice Server set up via “Libvirt Preview” ( http://repos.fedorapeople.org/repos/jforbes/virt-preview/fedora-14/SRPMS/). 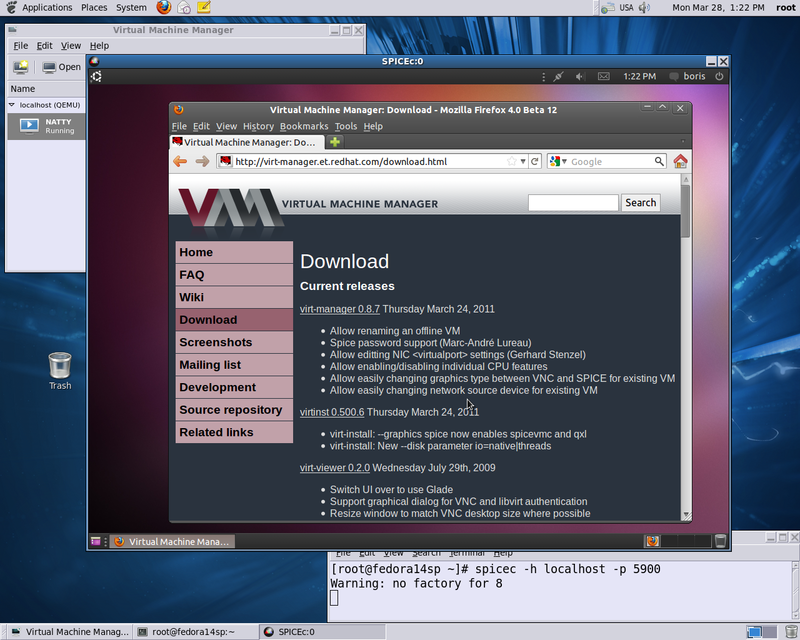 Configured KVM Server allows to create Ubuntu 10.10, 11.04 Desktop KVM beta 1 (64 bit), which may run in spice session. Notice that Virt-Manager 0.8.7-2 does have SPICE support. 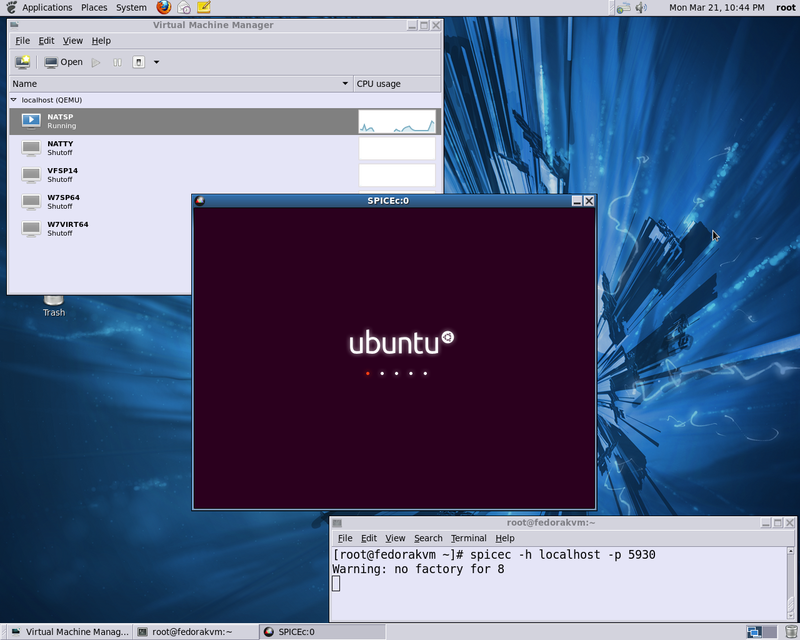 It allows to switch particular VM from VNC Server to SPICE Server and run spice session via GUI or connect to VM via command line locally or remotely. In this case Spice Display Screen will show address 127.0.0.1 and connections to VM via spicec will be available only locally. Old way with modifying XML definition and connecting via command would work as well. Following bellow is attempt to test mentioned patch to resolve problem with loading KVM with “-vga qxl” by /usr/bin/qemu-kvm (v. 0.14) on Fedora 14 ( Libvirt Preview Environment ) . View : http://patchwork.ozlabs.org/patch/84704/. 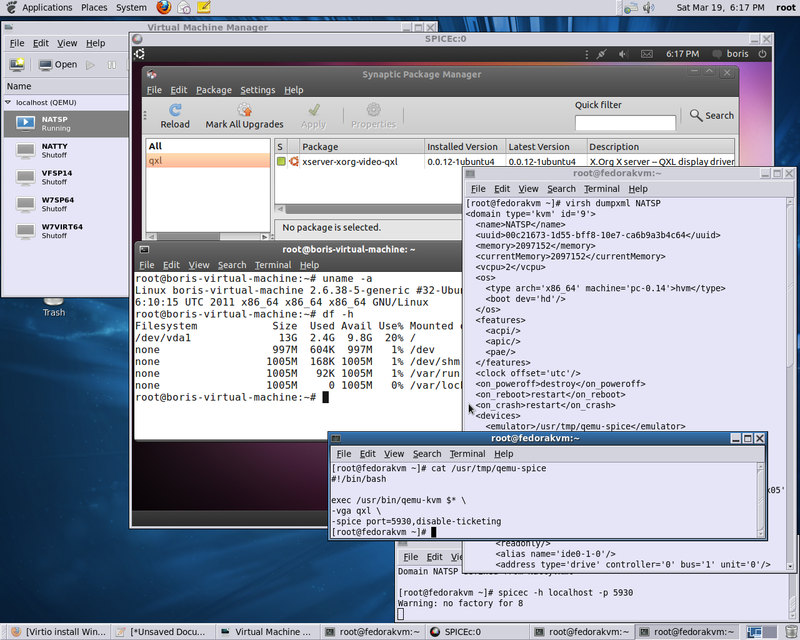 Test was successful for SL6,F14,W2K3,W7 KVMs (without QXL driver installed) and failed on Ubuntu 10.10 KVM no matter of presence or absence of QXL driver. Install F14 KVM as usual as VFS14. qemu-kvm: /builddir/build/BUILD/qemu-kvm-0.14.0/qemu-kvm.c:1724: kvm_mutex_unlock: Assertion `!cpu_single_env’ failed. 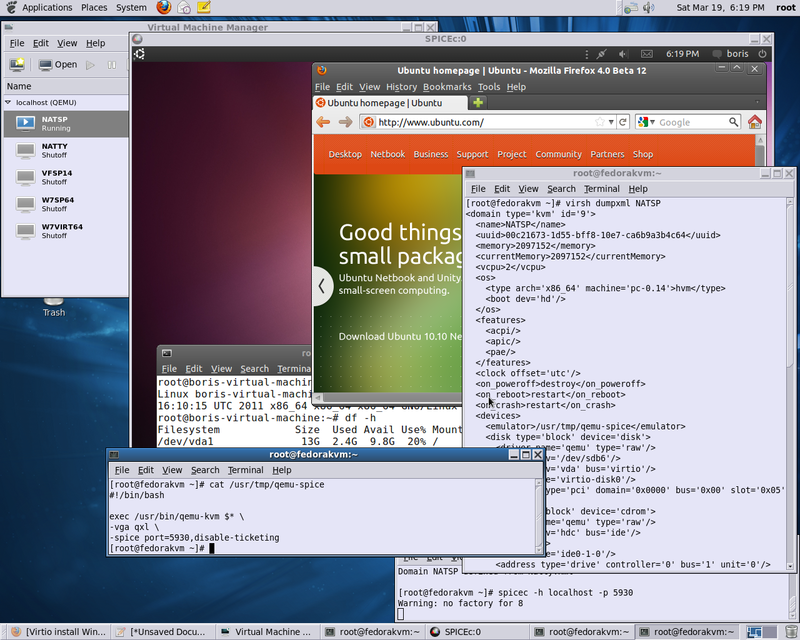 You are currently browsing the Xen Virtualization on Linux and Solaris blog archives for March, 2011.